Google+ was launched a few months back when it was a limited invite-only service. Later in September, it was open to the public. 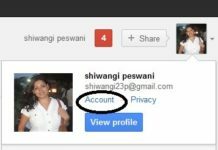 Unlike Facebook, Google+ did not allow businesses to have a Brand Page till now, and a few businesses who had created a profile as a personal account were banned by the Google+ team. 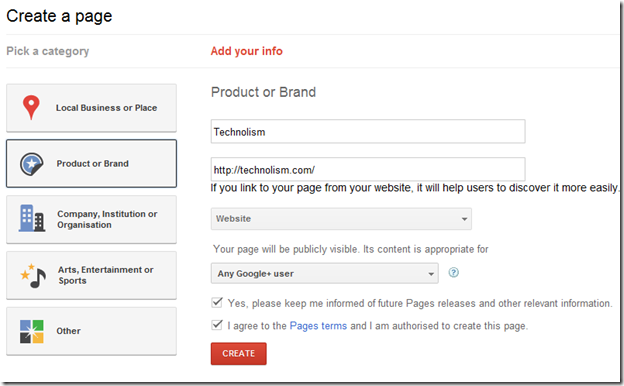 Finally, Google launched Brand Pages on Google+ which gives a go ahead to brands and businesses to create their own brand / product pages. 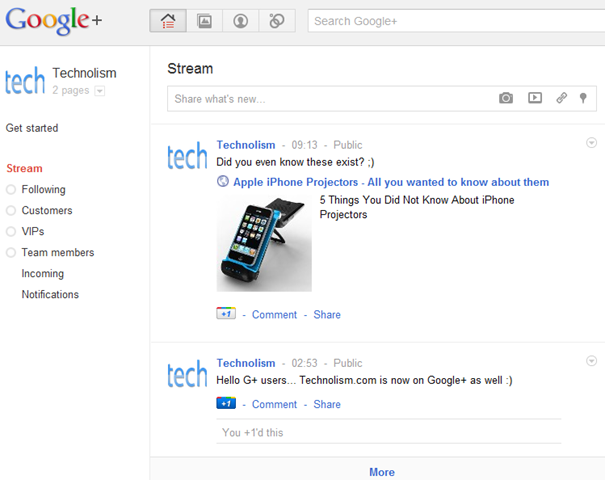 We created one for Technolism, do check out Technolism Google+ Brand page here. 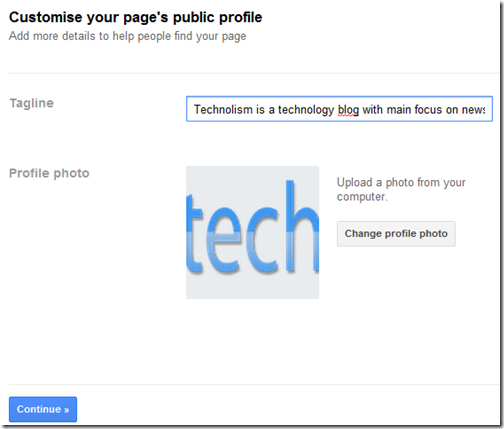 In this post, I am going to show you how to create a Google+ Brand Page for your business. Log in to your Google Plus account and go to http://www.google.com/+/business/ and click on “Create Your Google+ Page” button. 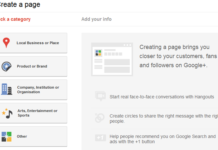 When you click on Create Your Google Plus Page button in Step 1, you will be taken to the second screen where you can choose the category of your brand / product / website / blog. Companies, organisations, non-profits, institutions, etc. You may list your business here if you can’t fit in any of the categories above. We entered the information for Technolism as below. 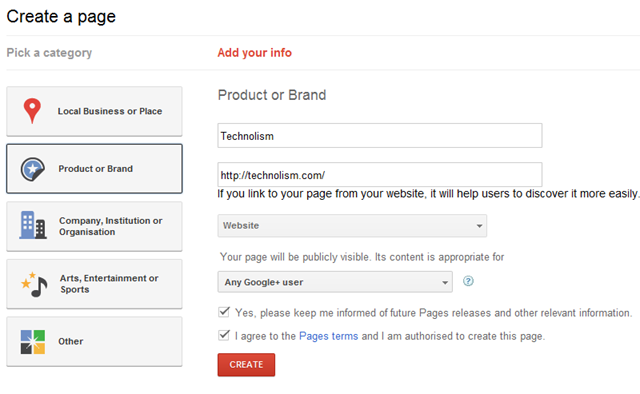 If you also have a blog or website, select the Product or Brand Tab and fill in the details like below. 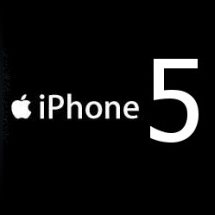 Now, you simply need to add a short and simple, yet catchy Tagline for your business and a Profile photo. On the next screen, you get the option to let people in your Circles know about your new Brand Page for your business. Click on Finish button. Do a small other tweaks on the Brand Profile Page and you are done!! 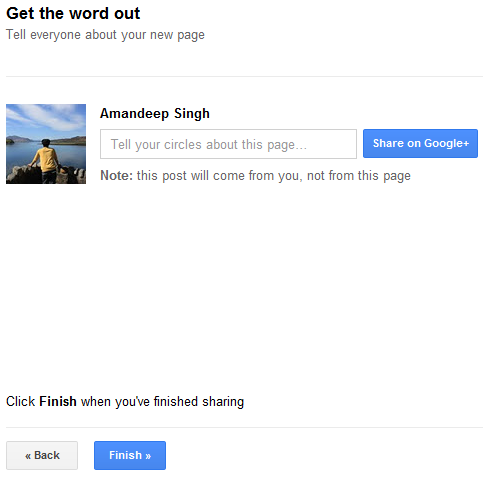 I hope you liked this simple tutorial which would help you create the Google+ Brand page for your product / brand / website or blog. Do share this with your Facebook, Twitter and Google+ friends. Stay tuned for more news and tips on Google+. 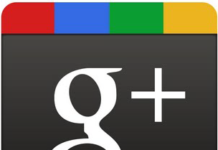 In the meantime do not forget to add us to your circle on Google+. We are also on twitter now; do follow us @technolism.